As Earth passes through comet Tempel-Tuttle’s orbital path and encounters its debris, we will be treated to November’s Leonids Meteor Shower. One comet’s trash becomes our planet’s treasure as the dust left by Tempel-Tuttle is transformed into a fiery meteor shower as it hits our atmosphere. Join Helen Avery and Bob Berman tonight at 7pm EST (00:00 UTC) as they prep you to go outside on this dark, moonless weekend night to enjoy the spectacle for yourself. Until then, read Robert Frost‘s poem about the Leonids, as well as other posts about it in Illuminations, including about the constellation Leo where it appears. 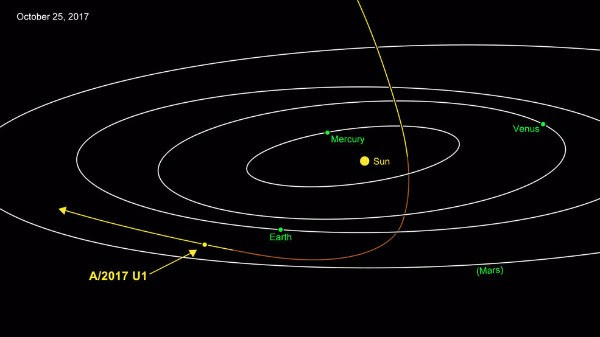 We recently had an interstellar visitor arrive in the solar system, the first time in recorded history that astronomers have captured images of an object passing through from another solar system! Members have been talking about it in Discussions. Next Black Caviar – Coco ft. u.n.i.